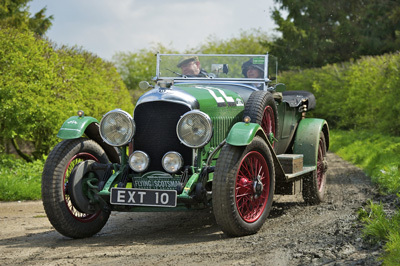 Syd Stelvio's reports from the Endurance Rally Association 2012 Flying Scotsman. Dawn breaks over the old wartime airfield of Duxford with a most welcome surprise ~ blue skies and not a cloud in sight. By the time the first cars arrive to line up under the Starter's archway, with BBC and ITV reporters joining the throng, bright sunshine has forced its way over the far horizon. A skylark begins a steady upwards climb immediately above a parked up Catalina flying-boat, but birdsong is soon drowned out by the might roar of engines. John Abel and Mike Hope in their 1937 Lagonda rev the four and half litre big-six and roar off as the flag is raised by the immaculate Georgina Riley, dressed in her authentic outfit straight from the 1930s. The first timed test of the day is further down the airfield, only half a mile away...the pressure begins in earnest straight from the box. The record entry list of 106 starters makes this now the biggest timed road event in Britain for pre-war Vintageants. The demanding route of nearly 1,000 miles to finish north of Edinburgh taking In some of the most breathtakingly scenic roads on offer was never going to be easy and as the day wore on several crews were nursing niggling teething-problems. The strikingly-painted pale blue Delage D6 from Belgium of Jan Coen was going no further than Duxford and retired on the spot with engine problems. Charlie and Nellie Bishop seemed to avert a disaster in their Vauxhall 30-98, having spotted that they had run out of oil. Franco Lupi and Martin Buri in their Bentley Speed Six suffered a puncture, something of a first as the car completed the Peking to Paris without a single puncture...it lost the crew 40 minutes after discovering the jack was not strong enough for the heaviest of Bentleys. Brad Mottier and his son had problems of their own, with what they thought was simply running out of petrol, but it turned out the 1936 Riley had a dud battery...fortunately they had a spare. Today’s competition consisted of the handling test at Duxford, Then onto Weston Woods, for narrow and twisty Tarmac, regularities at Postlingford and Assington Green, onto Hawkedon and Lavenham for more of the same, a coffee stop at a whisky distillery, regularities at Shipden, High Green, and Lyons Green, an off road test in Lincolnshire farmland, and this is all before an excellent lunch that included an on-site prepared main course of mushroom stroganoff prepared by the Royal chefs of Sandringham. The afternoon saw the pressure maintained, including several laps of an interesting circuit... among the spectators we spotted former works rally and racing driver Jack Sears who introduced himself to several crews, and former BBC presenter Tony Mason was one of several hundred marshals. So, who is winning after all this? The immaculate Talbot 105 Alpine of Gareth Burnett and Jeremy Haylock have a four second lead over the scruffiest car in the event, the amazingly driven Frazer Nash of Robert Ellis and Cath Woodman, with the Bentley of Nigel and Gina Batchelor third, seven seconds behind the chain-drive Nash. We left north Lincolnshire for remote and very rural roads that twisted and turned steadily North into Yorkshire - a varied day that has seen the rally finally reach our overnight halt in Durham, and still the two crews who locked horns to tussle for the lead yesterday continue to box away at each other in a bid to tighten their grip at the top of the leader board. 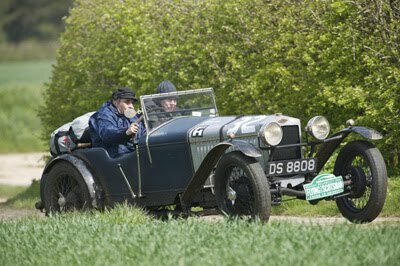 The pea-green Talbot 105 still leads the rally - at lunchtime the lead was five seconds over the Frazer Nash of Robert Ellis. With navigator Cath Woodman hanging out of the side of the car to give her driver elbow room every time he wants to change gear, the progress of the Nash has been an impressive team effort, but this afternoon the Talbot made a bid to shake off the terrier snapping at it's heels, and rolled into Durham this evening having pushed hard enough to open out the lead to 23 seconds. In the car park, Ellis complained that the fabric bodywork was falling apart, but he visibly looked more cheerful when offered a roll of tank tape. Nigel Batchelor tumbled out of the top of the premier league, falling from third in his Bentley to 21st, Alastair Caldwell with Catriona Rings had a good day to move their Alfa Romeo to third, five seconds over Paul Carter and John Bayliss who are now 4th in the Derby Bentley that won the first two editions of the Flying Scotsman. Other notable drives today include Americans Brad and Barry Mottier in their Riley, now 15th, David and Sarah Rayner in their BMW, 12th, and Peter Livanos and Alex Drouliscous have lifted the Alfa Romeo Type 8C Zagato up to 9th. Sue Shoosmith and Trina Harvey are equal 5th in their Bentley sharing a tie for this spot with the Riley of Andrew and Jonathan Davies. It's been a day of problems for some, and the expertise of our team of specially equipped sweeper mechanics who drive the fleet of mobile workshops (the Endurance Rally Association own and maintain their own fleet of 8 vehicles), has been tested to the full today. The Alvis of Francis Galashan had a shock absorber fall off, twice ran out of fuel, and had four out of six cylinders firing; and Julian Balme and Chris Hosegood in their Lincoln Continental had the clutch let go.... they're now out of the event. 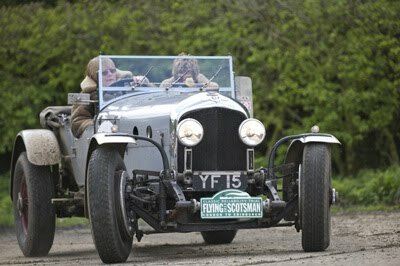 The Derby Bentley of James Mann and Sarah Ferguson was reported to be down to two cylinders this evening. Several crews report electrical problems, particularly starter motors... But we have yet to see anyone using a starting handle. Last night the car park servicing was reinforced by the additional service support of The Banhams who straightened out a Bugatti steering arm, bent through being towed badly. In the team-prize stakes the Bentleys are beating the Talbots. The marque-team leaders are Peter Brennan and Mick Briggs, Sue Shoosmith and Trina Harvey, and Paul Carter and John Bayliss. Today has gone well, with the army of marshals from local motor clubs from as far as Bournmouth leap-frogging up the route, transforming the complexities of a logistical exercise that has seen nine months of diligent planning, to turn it all into a well-oiled machine which won high praise today from Talbot driver John Ruston: "It all looks like it runs as smoothly as a Swiss watch". With every Control manned, and every Test section running well, the team under Chief Marshal Bob Redhead have worked particularly hard in challenging conditions. Tomorrow we head into the wilds of Northumblerland and on into the Scottish Borders for the grand finish of St. Andrews. It could all change inside out and upside down before the trophy presentation. The sun broke through as cars crossed the Scottish Border. Today's string of competitive sections changed the order totally. 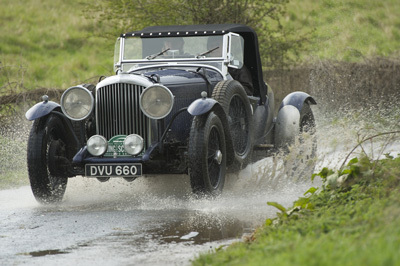 Firstly, news of the Frazer Nash, which left the road this afternoon. Robert Ellis emerged with just a few bruises but navigator Cath Woodman was taken to hospital after rally doctor Dr. Paul Rees diagnosed a fractured shoulder. The Nash dropped a few places this morning which caused the first shake up at the top. This afternoon, a regularity on remote farm land was hampered when a flock of sheep caused havoc. Clerk of the Course Kim Bannister reluctantly decided to cancel the timing of an intermediate section. The results tonight reflect a hectic days rallying, with Alastair Caldwell climbing from fourth into first place. Gareth Burnett who had led the rally from the start - and incredibly this is his first attempt at driving a road rally - slipped to second in his Talbot. Third was Paul Carter and John Bayliss, in the Bentley that won the first two editions of the Flying Scotsman. Fourth was the car that won last year, the 1500cc Riley of Andrew and Jonathan Davies. Brad Mottier and his son collected the Against All Odds trophy, and David and Sarah Rayner won the Best Dressed Crew trophy.